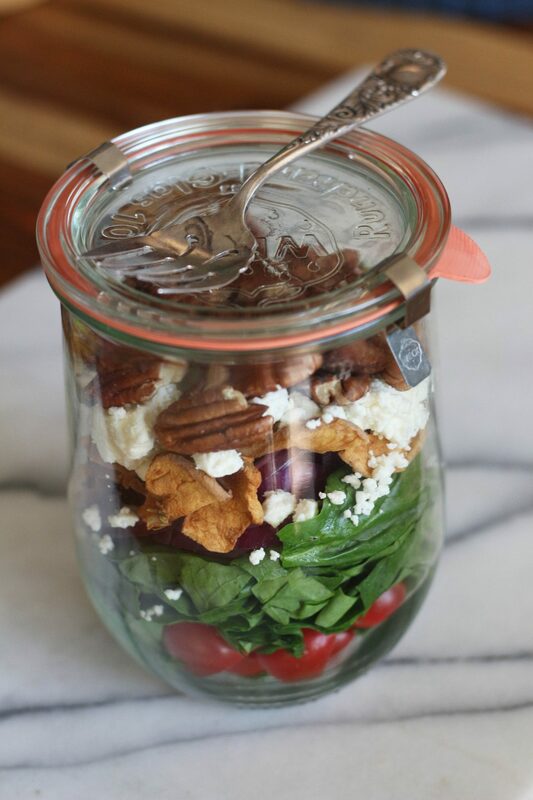 Layer all ingredients in jar in order, starting with tomatoes on the bottom and topping off with pecans. Eat immediately or cap and place in refrigerator until ready to eat. 2 Responses to "Salad in a Fermenting Jar"
I’m intrigued by the ingredients in this recipe – the combination sounds delicious – but I don’t understand the necessity of the fermenting jar. Why would you make it in the jar if you’re going to eat it right away? And if you cap it and put in fridge the idea is just to keep it fresh for a bit and not to ferment it? You don’t need to put it in a fermenting jar if you don’t want too. Red, White, Blue and Cultured Too! !